NFSA's Illinois Chapter and Illinois Fire Inspectors Association is inviting AHJ's Code Officials, NFSA Contractors, and Property Managers to a FREE seminar. The seminar will take place on Thursday, November 30, 2017 - 8am to noon at Medinah Banquets. The building owner is the single most important individual in the inspection, testing, and maintenance of fire protection systems. NFPA 25, Standard of Inspection, Testing, and Maintenance of water-based fire protection systems contains numerous detailed requirements that are the responsibility of the building owner, yet many building owners are not familiar with these requirements or with the fire sprinkler system in their building. 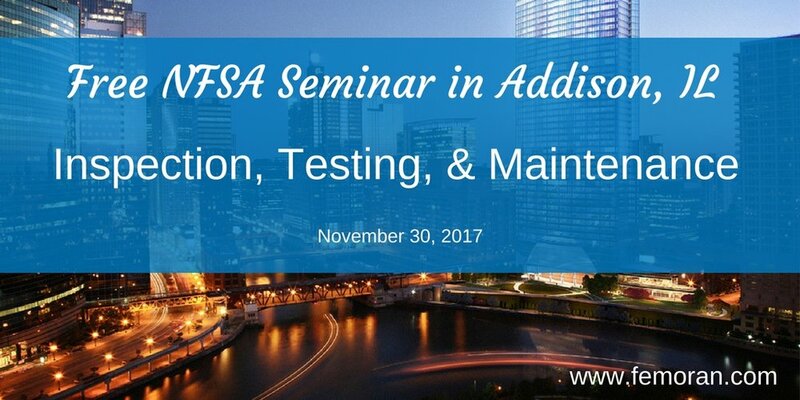 This half-day seminar will provide an overview to fire sprinkler systems and the owner's requirements and limits when it comes to inspection, testing, and maintenance. The seminar will help building owners/managers better understand your local inspection, testing, and maintenance (ITM) requirements for their fire sprinkler systems.